Mayday is a people-powered project run by the Mayday Collective in tandem with various organizing projects, and a slew of other friends, collaborators and area residents. The Collective is where the rubber hits the road. It holds operational power and makes the bulk of organization-wide decisions. It is responsible for Mayday’s health and advancing our social justice mission. Pati Rodriguez is a Bushwick native, born in Ecuador but raised in Brooklyn all her life. Through Mayday she develops programming that caters to the POC immigrant community and has launched empowerment projects such as Mi Casa No Es Su Casa: Illumination Against Gentrification. When not at Mayday, Pati offers legal clinics and Know Your Rights trainings to immigrants, supports organizing efforts with Latinx youth, and is the host and Executive Producer of Loca Vibes Radio. Lucas Shapiro is dedicated to multi-issue movement-building and works as a human rights educator with the IHP study abroad program. He has been an community organizer with groups such as Families United for Racial and Economic Equality (FUREE) and the West Side Neighborhood Alliance. He draws inspiration for Mayday from his connections to social centers in Spain and is maybe just a little obsessed with political strategy, public policy, popular education…and game nights! Sandy Nurse grew up overseas in multiple countries on almost every continent, but has spent many years putting roots down and building family in New York. She is the founder of Bushwick’s Know Waste Lands Wildlife Garden, BK ROT, a youth-led composting service and is a member of Brooklyn Community Board 4. In a past life, she worked for the United Nations Development Programme and World Food Programme. She is deeply involved direct action organizing and believes in visible resistance to white supremacy, imperialism and capitalism. Zyad Hammad‘s interest in post-colonialism drove him to leave his native California for a more international New York. Though he has a background in education and human rights, his immediate goal is to promote collaboration, skill sharing, and horizontal decision-making in grassroots institutions which aim to serve the most marginalized communities. A self-taught jack-of-all-trades, he takes an active approach in supporting others who share the vision that only thoughtful political acts will bring us closer to a just future. R&B, the ocean, and film from the 70s are his mainstays. Josh Carrera grew up in Bushwick off the Wilson Ave stop on the L train. He left his neighborhood in 2008 to study natural resources planning and economics in Vermont and Latin America. He returned in 2014 to work at The Nature Conservancy and now serves as the Program Manager for the Center for Whole Communities. He is deeply committed to organizing around issues of housing and environmental justice. In his free time, Josh likes to go salsa dancing and loves to attend slam poetry shows. Rahel Biru joins the Mayday family as our HOST & CARETAKER, keeping the space welcoming, tidy, and well-organized for everyone holding events here. Using her aversion to clutter and sentimentality, Rahel has been able to streamline internal procedures and reorganize companies of over 200 people. She has worked in many industries and offices of various sizes is excited to bring those characteristics to something that shares her values and commitment to positive change. Rahel is one of the co-chairs for the largest chapter of the Democratic Socialists of America and is happy to answer questions about it! Follow Mayday on Facebook for event info, photos, org updates, and other ways to get involved! 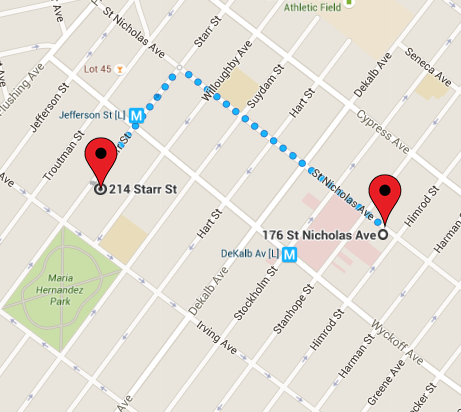 Mayday is located in Bushwick, Brooklyn, a short 9min walk from our sister space Starr Bar. Mayday Space: Take the L train to the Dekalb stop exiting at the intersection of Wyckoff Ave and Stanhope St. Walk against traffic on Stanhope and take a right one block up at St. Nicholas Ave.